Played a total of 2387 times by 330 registered members. Finished by 302 users who rated the difficulty as easy. You solved this puzzle in 2 minutes and 45 seconds with 143 attempts. You solved this fun puzzle in 4 minutes and 25 seconds with 140 attempts. I am really sorry about the 9 clue. The clue worked just fine for 131 but works not at all for 130. For 130 you need to move it as soon as the 10 comes down. I left the house before I was aware of that and forgot to change it. Cute kitty mcr! A new one? Name? 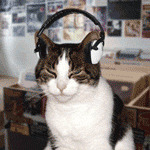 Almost didn't recognize you without the headphone kitty! Better try this game before its tomorrow. Happy Birthday Jac!!!!! Hope it was a great day for you! Does Donna have to put $$ in her own Cayman account if she says the a****************h word? I wouldn't worry about playing the 9 straight up. I haven't figured out how to do that and it does seem to work fine. Some days you have it..and some days you've just got nothing lol!!!!!!!!!!!!!! blahhhhhh at myself! !